Banzai! From mysterious hideouts and perilous forests new challengers enter the great tournament of Vudù. Hilarious spells, silly artifacts and irreverent curses will take your Vudù games to a new level of wickedness! Speaking about gameplay, Vudù: Ninjas vs Pygmies extends the number of player to a minimum of 2 and a maximum of 8, and introduces two new schools of magic: the deceitful Ninjas, that hide their curses making them difficult to remember, and Pygmies, fast and deadly, with fast curses that can be cast with just an ingredient. 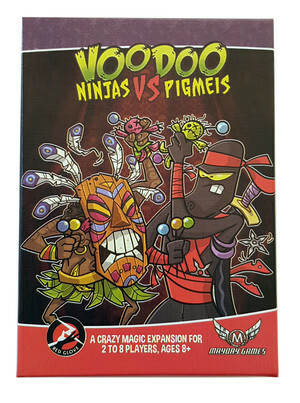 Vudù: Ninjas vs Pygmies includes the Vudù expansion for the adventure games of the Super Fantasy series!